Those nights are getting shorter, and Spring is trying very hard to push through the April winds and showers. The recent warm spell in March has played havoc with hibernating bats, but the nesting season is well and truly underway with blackbirds and robins brooding or already raising young. Bumble bees are steadily going about their business, but may need a helping hand during inclement weather, and female wasps have also woken from their slumbers and are to be seen seeking out a suitable site for their new nest. Life at the LCH Sanctuary goes on, with two newcomers coming into care, now safe and content. We are looking forward to seeing our swallows return to nest in the barns and stables, watching our hedgerows transform into tapestries of nature's beautiful colours, and catching a glimpse of strong, healthy bats on the wing at dusk. 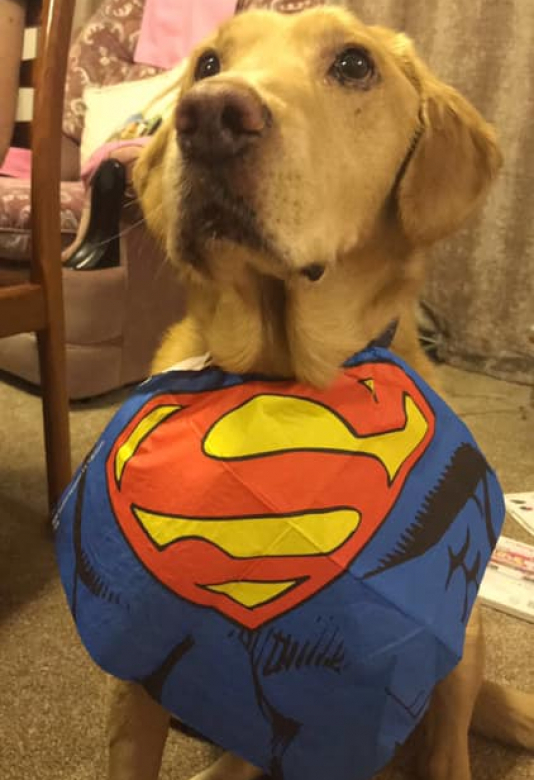 Meanwhile work continues in all areas of rescue, from the frontline essentials of saving lives and finding new homes, to the background work of admin, home checking and organising fundraising events. Life is never dull in rescue. Our first dog show for the year is Sunday 7th April, at Crofthandy Village Hall, Nr St Day, and we are looking forward to seeing our loyal supporters, and meeting new ones. 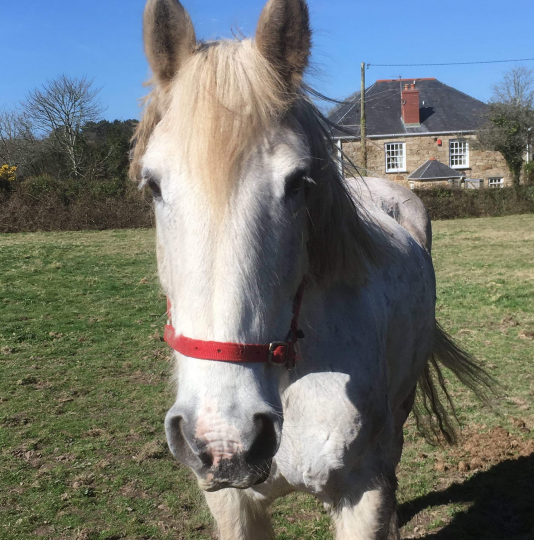 Here is our April newsletter, with Pippin's story, some happy Gotchas, Rosie's Mini Quiz, and Sanctuary news, along with our regular features. 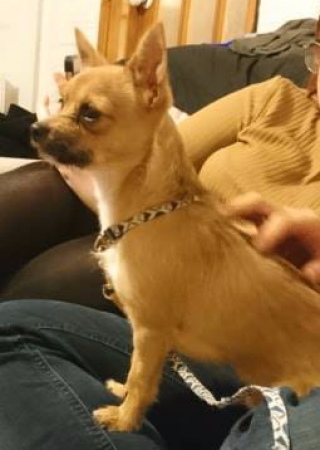 A big hello to little Arnold, a 7 month old Chi cross, who came into foster care recently and is now ready for his forever home. 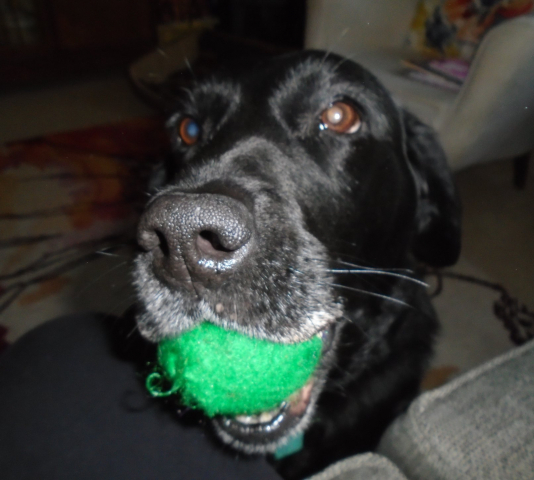 His foster mum says 'Arnold is a very happy boy, who loves to play with his ropes and dinky tennis balls.' Applications are now closed for Arnold and we feel it won't be long before this lovely chap finds a new lap to curl up on. 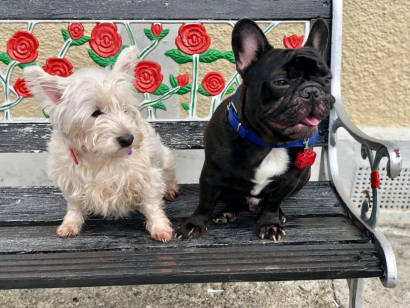 You can find more information on our other dogs by visiting our website pages: for foster or for adoption. Also our Facebook page. 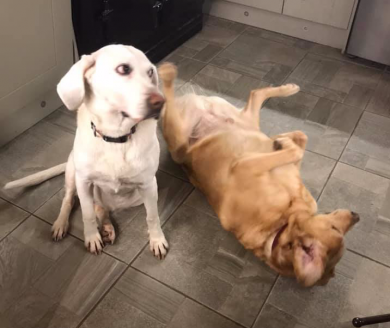 Elsa, a 14 year old yellow lab, came into foster in January; this sprightly girl has joined her adoptive family, a pal for Budley, another Last Chancer, who has been waiting some time for the right girl to come along. Never give up hope.... somewhere out there is your perfect partner. 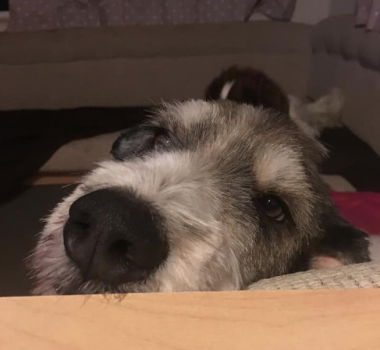 Daisy, Daisy, give us your answer, do.... or more precisely, will someone please give Daisy the answer of a quiet, patient, mature home, where she will have the time to settle and the help she needs to deal with any issues she may have in her new surroundings. 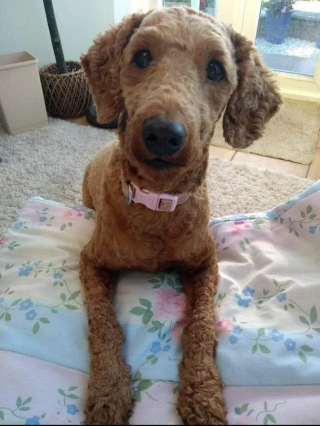 Cockerpoo Daisy has sadly been neglected and unsocialised and as a result has some fear issues; but given time to trust, she is a delight to live with and really is a fun girl to have around. You can find out more about Daisy on her website page. The recent very warm weather has been waking hibernating bats, much too early for them to find enough food to sustain them. The weekend of 23rd/24th March was a bumper one for bat arrivals, with 4 bats coming in to rescue, all from different places, and being transported to Sue Harlow for her special care. Many thanks to Jason, Theresa, Cheryl Allen and Fiona Dyer for jumping into their 'batmobiles' to come to their assistance. Meet our new kids on the block ... firstly, Madamoiselle Bublè or Bubbles for short... her history is one of abuse, which we won't elaborate on. But she is safe now .... she has a skin problem which is being addressed daily, she has a massive appetite, and she is loving life now. Bubbles absolutely (and surprisingly) loves people... happy days now sweetheart! And Gandalf the Grey, another soul who has only known neglect and hardship. Safe now old man, enjoy the sun and new pastures. 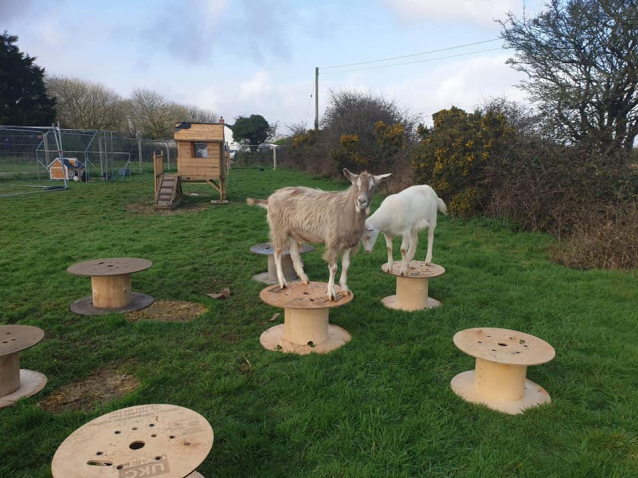 A massive thank you to Kathy Simmons for the goats' new toys, they love 'em! Thank you Naomi Field-Jones for a big box of seeds for the sanctuary veg plot and polytunnel. Fab produce for our animals, now to get them sown! Beautiful Lita came into rescue in November 2014, in sad circumstances. 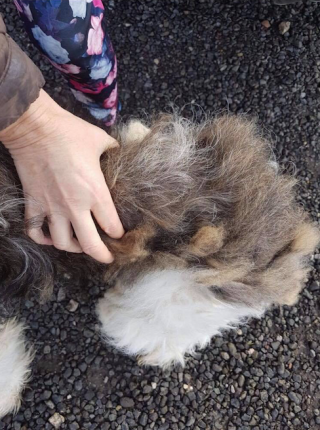 Another dog, named Nanny, had been due to come down on the transport run, but to everyone’s distress she was found dead in her bed in the kennel. Little Lita was given her last chance instead, and came down into foster with Louisa in her place. She was Louisa’s first foster, supposedly in her care for just for a week or so following a dental, but the family couldn’t help falling in love with her, and she ended up staying. 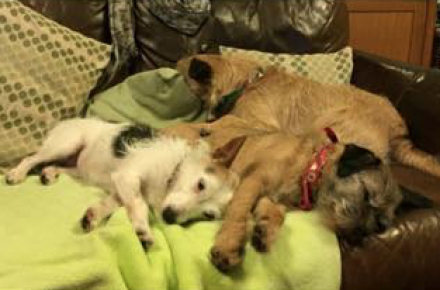 Lita made herself at home straightaway, settling down with Louisa’s two other terriers, who were briiliant with her and became the best of friends. 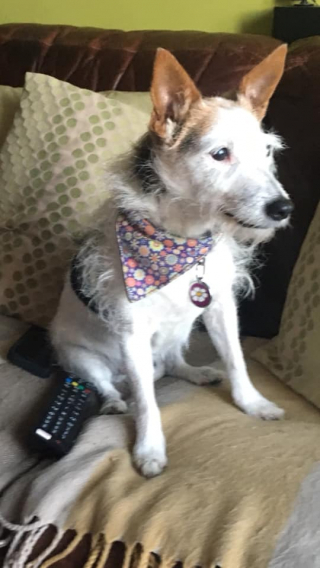 She would occasionally help Louisa with the LCH admin, and thoroughly enjoyed running about with her friends at the dog walking paddock, as well as causing a stir and lots of laughs at one of the LCH dog shows. 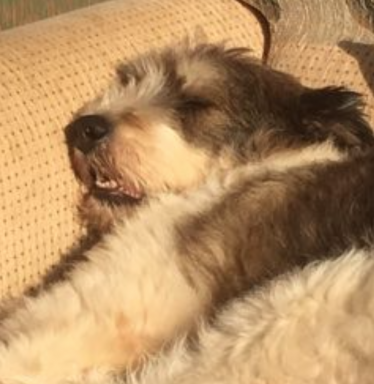 Age eventually caught up with her, and Louisa and family made the heartbreaking decision to help Lita make her way to Rainbow Bridge. This girl had over 4 years of love and cuddles, canine and feline companionship, and such a happy life as she could only dream of when she was waiting in the pound. All our love to Louisa and family, who still miss little “Fajeets” badly; run free little Lita, have fun at the Bridge. The first LCH dog show of the year is imminent! 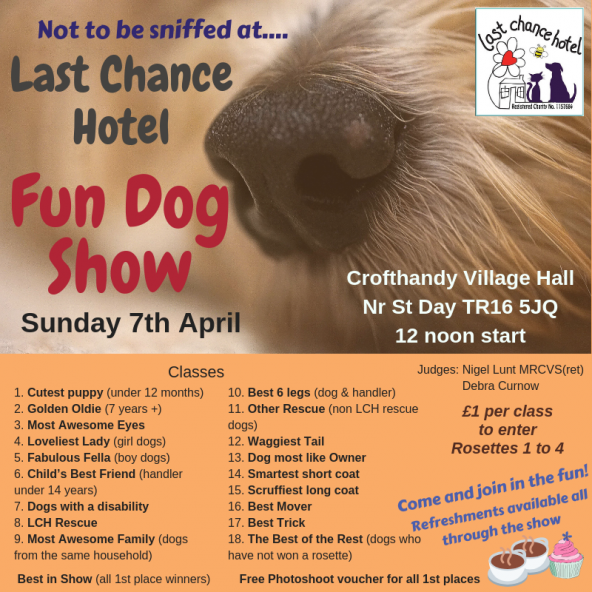 Sunday 7th April at our usual venue of Crofthandy Village Hall, Nr St Day TR16 5JQ, a Dog Show putting the fun in fundraiser! Come and meet some of the LCH team members, show off your pooches and help us raise vital funds for our vet bill. There will be refreshments available all through the show. Details of classes on our website events page. Don't forget the LCH Bonus Ball page. If you would like to join in and have a flutter, please like the LCH Bonus Ball page here. You have to be in it to win it! Your vote made the difference!! 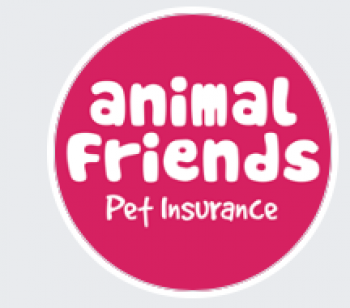 We have been on tenterhooks waiting for the outcome of the Animal Friends Pet Insurance vote, but at last we heard that we made the cut and are one of the 10 lucky charities to receive £1000 from them in their recent giveaway. A HUGE THANK YOU to everyone who took the trouble to vote for us, this really made our day. A fantastic gift that will help enormously and every penny will be spent directly on our rescue animals. This was a close run thing, proving that your votes really do count, and can make that vital difference. 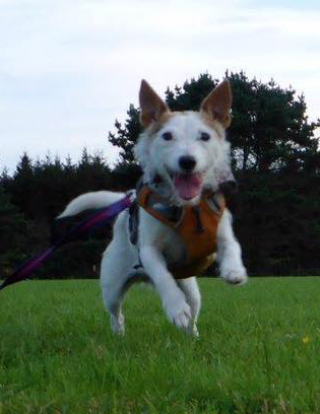 You may remember Pippin, who came into the care of LCH suddenly and in very poor health. He has been adopted by Laura and is now living with her on the LCH Sanctuary. This is his story. 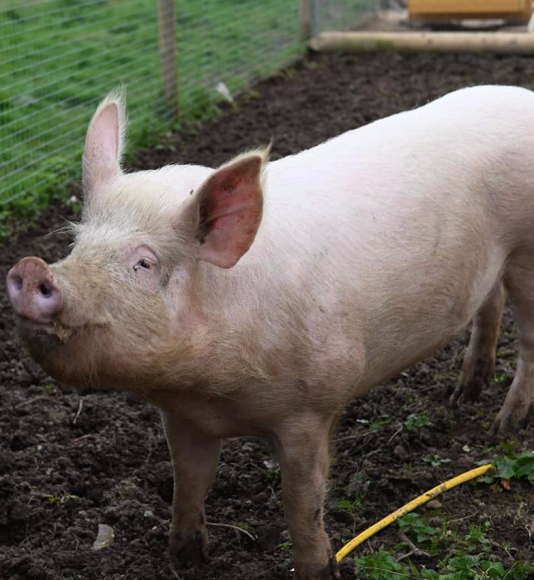 In early December last year, LCH founder Sam received a phone call from an independent animal transporter who was concerned about one of their charges. Pippin was a Romanian rescue dog (or ‘Rommie’, as they are commonly known); he was being transported to a different foster home within the confines of the Romanian rescue set up. Sam responded to the transporter's request, meeting them and then taking Pippin into the care of LCH. He could hardly stand on his back legs; he was excreting liquid black poo and very dark urine due to starvation and dehyrdation. His weight was 18.5 kg; when he was seen by our vet, he scored 1 on the body condition scale, where 9 is perfect health and 0 is dead. All in all, he was in a very sorry state. Pippin went to stay with one of our fabulous fosterers, who showed him love and kindness, and gently fed him cans of ID food to help him adjust to eating again and get his system working properly. He began to put on weight but it was clear that he needed a more active place to live. Pip also suffered from separation anxiety and wasn’t clean in the house at this point. 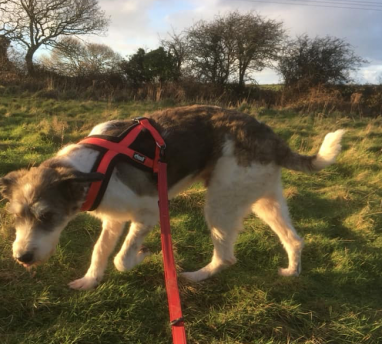 Laura had taken a shine to this boy when she had delivered him to his foster home, so on the 16th December she picked him up and moved onto the sanctuary with him and her other 3 dogs,- two terriers, and a tri-pawed Springer called Lewis. Pippin and Lewis bonded instantly and although Lewis is a year younger than Pip at 2 and a half, he 'daddied' him from day one. 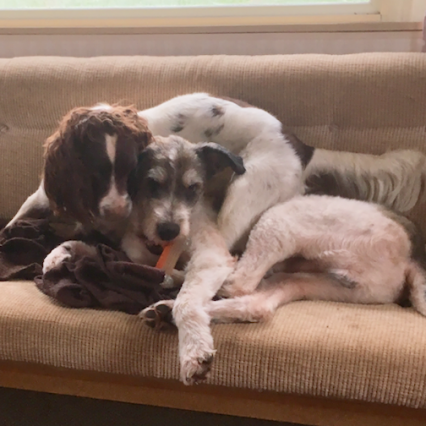 Laura says they are so well suited, Pip has learnt to play properly and now he is bigger and stronger than Lewis, he is still very gentle with him bearing in mind Lewis’s left front leg is missing. Pippin has steadily gained weight and is now at his ideal weight of 28.5 kg. He gained 10kg weight in six weeks! He is on ‘normal’ dry food now with the odd tasty treat, boiled eggs being his favourites. Pip had an operation to remove a large heavy cyst from his shoulder and also his hind dew claws, from which he healed up very well. 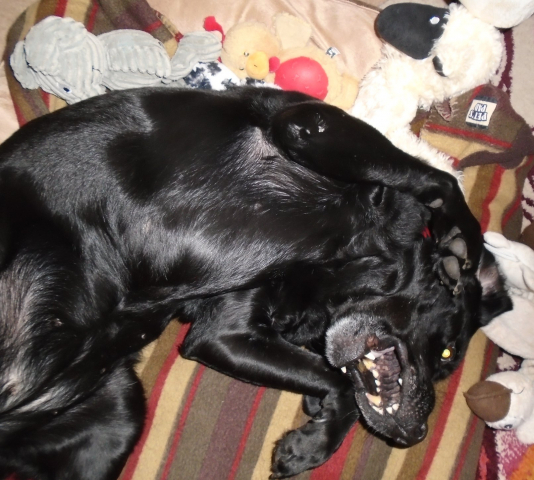 He is a lovely sociable dog and is responding well to basic training. 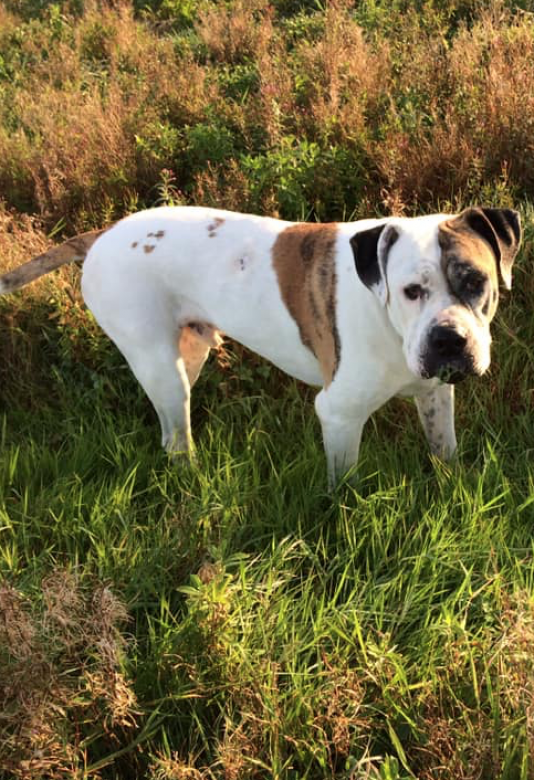 Considering the massive lifestyle change he has endured he is the sweetest gentlest boy. Laura says he is good with food but will seize the moment if you leave a tasty treat on the table! She adds “He loves to snuggle up on the couch and prefers to fall asleep maintaining contact with me, which just makes my heart smile. He quickly settled into a normal routine with us, and was clean in the house after a couple of days”. Pip’s separation anxiety has improved immensely through careful and patient handling by Laura, and he can now be left without issue. This gorgeous boy is now happy, settled, and very clearly feels safe and secure with Laura, Lewis and all his new family; after such an appalling start to his life in the UK, he now has a fab future to look forward to. A wonderful waggy tail ending! 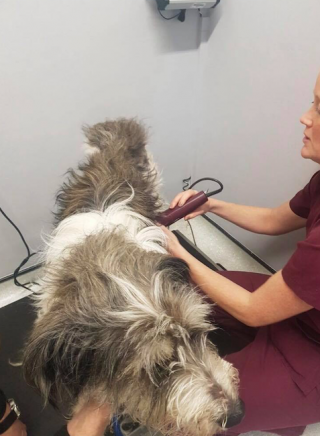 Pippin is just one of many LCH dogs who have needed emergency veterinary attention in recent times, and we will always do our best to ensure that all animals under our wing receive the best possible care whenever required, but we need your help. Our vet bill now regularly exceeds £7500 a month. If you could spare a few pounds now, or even better, each month, we would be very grateful. Rosie is an ex puppy farm breeding girl. 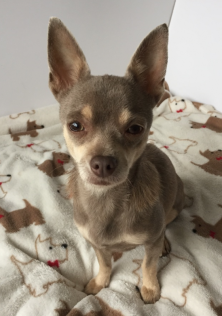 She came into rescue last September with several other Chihuahuas and now has a loving home with an LCH volunteer. She is very inquisitive (nickname 'Nosy Rosie') so we thought she would be ideal to host a miniature quiz! Most of the answers can be found in the newsletter. Who are the latest newcomers at the Sanctuary? What is the term used for a dog that has lost one of its legs? Tricky one: Name the only three mammals in the UK that hibernate.